Spread your wings and fly in this butterfly mask with a base of plain ecru clay splashed with shades of purple, red, copper, black and white. Rhinestones adorn the center of this somewhat flexible and comfortable mask. Make it for Mardi Gras, Carnival or Halloween with the included template. Reshape the top of the template to create your own custom shape mask like the one on the right. Before you begin, condition all clay colors. Cutting should be done on wax paper which will allow you to easily rotate the work when necessary. step 1 - Download and print the mask template on card stock. Cut it out with scissors or a craft knife. step 2 - Roll out the Ecru clay on the number two setting of the clay conditioning machine. You will need four pieces to join together to create the full mask. Cut the pieces into squares using a wave edge blade. See the note at the bottom of this page about why the wave edge blade is a better choice for piecing clay pieces together than a straight cut edge. step 3 - Be sure to cut both horizontal and vertical edges of the clay with the blade. step 4 - When you have four pieces joined together that will accommodate the size of the template, use a sculpting tool to blend the seams. step 5 - Place the template over the clay. With a craft knife cut out the template shape. Set it aside. step 6 - With your hands roll out small tubes ofblack, copper, red, purple, and white clay. Group the tubes to create a cane. Roll a piece of black and copper clay on the conditioning machine at a # 6 setting. Wrap the thin black clay around the group of colors then wrap that in the thin copper sheet. Cut off a 1/2” slice with the straight blade. step 7 - Pass the slice through the conditioning machine on #6 setting. This will give you a very thin ribbon with the colors blended. Arc the straight blade to follow the outside edge of the clay and cut off the ragged edges. step 8 - These are examples of the designs you can create for the mask. Cut some cane pieces 1/8” or 1/4” thick and experiment to see what sizes and color combinations you can combine to create variations. Roll solid purple and red into tubes and cut off thin slices. Put them through the machine on #6 and alternate them between the cane pieces. When you arrange the pieces on the mask, drape clay across the eyeholes if you want. You can cut the clay away later. Use a diamond shape cutter to cut thin red and purple clay pieces for the center of the butterfly. With the end of the Etch N’ Pearl tool, cut out white dots. Also use it to make holes for ties in the sides of the mask. step 9 - Grab a few scraps from step #7 and roll them in your hands into a very thin tube. step 10 - Drape the tubes along the upper edge of the wings and upper edge of the bottom wings. step 11 - Roll out ecru clay on #2 setting to create a butterfly body. Use the template and a craft knife to cut out the shape. Press the wave blade onto the body to create horizontal lines. Place the body onto the existing mask body aligning the edges. 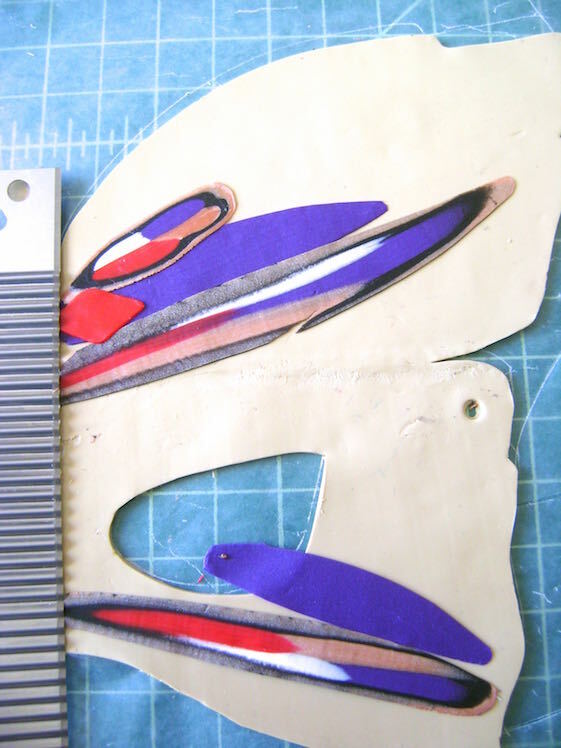 Use a round cutter to trim the bottom of the body to match the curve of the mask. step 12 - Press hot fix rhinestones into the clay outlining the center diamond shapes. step 13 - When your mask is complete, lay wax paper on top of the project. Flip it over and peel off the original wax paper. With a craft knife, cut out any excess clay blocking the eyes. step 14 - Cover a large soup bowl with aluminum foil. Wrap a wine cork in foil leaving a stem on one end to create a shape that mimics a nose. Place it on the center of the bowl. step 15 - Drape the clay project right side up over the bowl with the cork in the center of the mask and the top of the “nose” aligned with the eyeholes. step 16 - Place the project in a 275 degree oven for 30 minutes. Allow clay to cool completely. step 17 - Put cords into the holes on the sides of the mask and tie knots on the wrong side to keep the cord from slipping out. There are many ways to piece together cut edges of clay. It’s been my experience that clay cut with straight edges, even when they are beveled and matched, don’t hold together as well as edges cut with a wavy blade. The multi curved edges produced with the cut from a wavy blade, create more support when they are matched and blended together. NOTE: When aluminum foil comes in contact with clay while baking it will create a shine on the clay surface. This may or may not be important to your project. To avoid the shine bake projects on parchment paper. Premo Clay - Ecru 3 oz., Pomegranate Red 1/4 oz., Royalty Purple 1/4 oz., Copper 1/4 oz., White 1/4 oz., Black 1/4 oz.